Welcome back to the Gossip Girl Round Table. While fans of the show gather in the forums to discuss their favorite character and story line, our staff comes together each week to analyze the burning questions and best moments from the latest Gossip Girl episode. 1. What was the final score of the Humphrey family football game? DANdy: 42-39. Based on the pasts of Rufus and Alison, it's obvious the captains of both squads know how to score. A lot. LovelyLively: Girls 17, Boys 3. Alison was tough and fought for what she wants, while Rufus looked to punt in difficult situations. GossipGuy: 0-0. Did you see how terrible both sides were? 2. Did Rufus make the right choice? LovelyLively: Yes. That doesn't mean it was easy, or without a downside - who doesn't love Rufus and Lily together? He wouldn't be Rufus if he didn't try to make it work, though. Dan and Jenny surely agree. DANdy: Yes. You gotta put family first. And if Rufus and Lily remained close, they'd eventually get together and that would make Serena and Dan far too Marcia and Greg-esque. 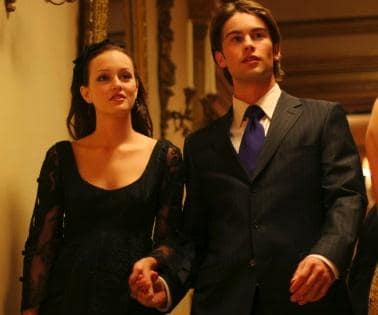 3. Who has the more dysfunctional family, Blair or Nate? GossipGuy: Wow, this is a tough choice, but I'm going to have to give it to Nate. His dad barely deserves to wear the pants he owns. Who cracks under the pressure of a figurehead position while living off your wife's money? DANdy: Nate. The wife makes more money than the husband. What kind of bizarro world do those Archibalds live in? LovelyLively: You'd think with a divorce pending and a gay partner in the mix, the Waldorfs would have this locked up, but at least Eleanor opened up to Blair at the end. Also, Nate's dad tried to kill himself. SIDE NOTE: Was this episode name created before there was a script? What gives? 4. What did Chuck do on this holiday? DANdy: I don't wanna get too graphic... but he stuck his thermometer inside many turkeys, all of whom thoroughly enjoyed his stuffing balls. LovelyLively: If Chuck did anything remotely scandalous, Gossip Girl would say something. So he probably just ate a lot, watched Dallas kill the Jets, caught up with relatives, reflected on the past year, etc. Standard.